The Brother Quattro 6000D Sewing and Embroidery Machine is the ultimate all in one machine for sewing, embroidery, and quilting. Buy the Brother Quattro 6000D Sewing and Embroidery Machine with confidence from Ken's Sewing Center. Our expertly trained customer service staff and technicians can answer any Brother Quattro 6000D Sewing and Embroidery Machine question you have. We also provide free training lessons with any new machine purchase. 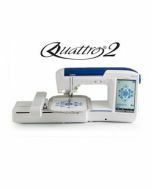 The Brother Quattro 6000D Sewing and Embroidery Machine has features such as InnovEye Technology, Runway Lighting, and has over 600 built in embroidery designs. Let the Brother Quattro 6000D Embroidery Machine inspire you with its ground breaking technology.